The Pornichet Select is the first solo mini race of the season here on the atlantic coast. The weather forecast predicted eastertly and north-easterly. predicting not very stable and cold but with quite a bit of reaching. We had 70 boats on the start line, fairly crowded, and passing the offset mark was a stressful moment in 15kn of very shifty breeze with all those boats around not manoevering very quick in single handed mode. 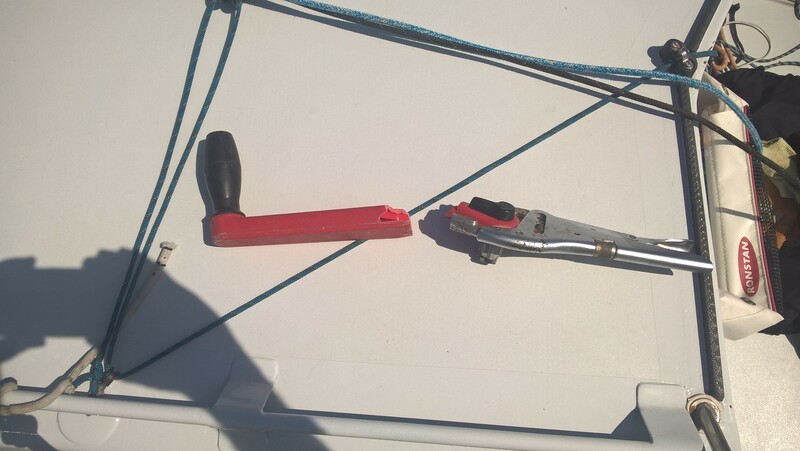 My first adventure started when I borke one of my winchhandles and lost the other one overboard an houre later 😦 Not a good situation on a prototype where the keel is canted by a purchase system wich is poyered by a winch, and adjustable rig yhich has to be put under tension again when adjusted. I figuerd out that i could put sheets from one cockpit winch to the other and stand on the sheet in the middle to tension it, so manoevres just got a bit longer with Simon jumping around on a sheet in the cockpit after every sail adjustement. Half way through the race after a good catch up on a reaching leg up to the 4th position I got myself tangled up in a lopster pot in the middle of the night, the line has cought just qbove the keelbulb, i couldn’t get rid of it by sailing backwards so I had to find a way to the line and I was not very keen on simming in the middle of the night on my own. I did not have anything long enough on board to get down to the line, so I Extended a mainsailbatten with my boathook and some tape. Finalement I was able to get to the line and cut myself free. Only by daylight I could see that there was still a bit of that lobster buoy hanging off my keel, that explainded my lack of speed after the incident. With a big lack of sleep and light upwind conditions the end of the race was complicated as I havent figured out my speedproblem in those sort of conditions yet and on top of that I was not that fresh anymore in my head. sometimes halucinating a bit and cerainly not alone in my head all the time. I lost auite a lot of places by going slow and being on the wrong side of a left shiftm I ended up in 12th position. Resume: some good points in there for shure an improvement from last race but still some work to do! I want tho thank all the sponsors and supporter of Eight Cube for this season! This entry was posted on April 25, 2017 by simonkoster. It was filed under Uncategorized and was tagged with 888, classe mini, eight cube, mini6.50, pornichet select, Simon Koster.